Route Sales Representative job involves around selling and delivering the goods on regular basis. 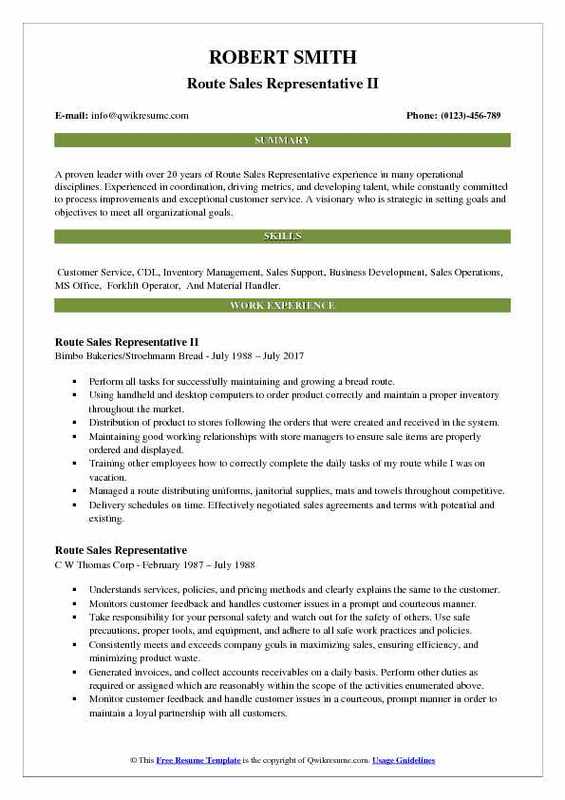 The roles and responsibilities typically listed in the Route Sales Representative Resume includes – taking the role of a salesperson by presenting the product’s attributes, offering the product for sale, taking responsibility of delivering the goods to the customers, gaining knowledge of the product that is being sold, solving issues of customers, updating client database and maintaining stock of inventories. Route Sales Representative should basically enjoy selling and have extensive knowledge of the product, they should be energetic and ambitious, and possess a good knowledge of acquiring new accounts. The most crucial quality of these representatives is to possess strong communication and listening skills. Most of the job types require only a high school education, while some prefer applicants with a college degree. Objective : 4+ years of experience as a Route Sales Representative is seeking to obtain a challenging sales/management position in a growth-oriented organization where I can apply my strong interpersonal, problem-solving and managerial skills. Skills : Customer Service, Customer Care, Payroll, Hiring, Compensation, Stocking, Delivery, Sales, And Management. Manages daily route independently to ensure accurate and timely delivery of the products. Reviews invoices daily for complete and accurate information and makes corrections as needed. Meets sales goals and promotes overall route growth to enhance profitability. Develops leads/prospects, calls on prospective customers to solicit business, prepares service agreements, and installs new accounts. Assists the sales organization with the procurement of additional new business. Understands services, policies, and pricing methods and clearly explains the same to the customer. Monitors customer feedback and handles customer issues in a prompt and courteous manner. Summary : Highly focused and innovative Route Sales Representative with an experience of 11 years and excellent sales and client service history . Especially adept at maintaining strong and professional relationships with customers colleagues and managers.Able to address multiple simultaneous customer queries and concerns with complete efficiency and accuracy. Skills : Customer Service, MS Office, Strong Organizational, Administrative, Analytical. Excellent Communication, Interpersonal, And Business Development. Assisted sale professionals in establishing new routes and building up new customers. Created a strong referral network that leads to more clients and more revenue. Processed returns of damaged merchandise. Transmitted sales on a daily basis through a handheld computer. Promoted sales through special displays, developing account relationships, use of promotional material. Maintained records of all sales sell and deliver product to established accounts. Minimize stale and wasted product. Responded to a special request, and resolved problems directly and through appropriate channels. Summary : A proven leader with over 20 years of Route Sales Representative experience in many operational disciplines. Experienced in coordination, driving metrics, and developing talent, while constantly committed to process improvements and exceptional customer service. A visionary who is strategic in setting goals and objectives to meet all organizational goals. Skills : Customer Service, CDL, Inventory Management, Sales Support, Business Development, Sales Operations, MS Office, Forklift Operator, And Material Handler. Perform all tasks for successfully maintaining and growing a bread route. Using handheld and desktop computers to order product correctly and maintain a proper inventory throughout the market. Distribution of product to stores following the orders that were created and received in the system. Maintaining good working relationships with store managers to ensure sale items are properly ordered and displayed. Training other employees how to correctly complete the daily tasks of my route while I was on vacation. Managed a route distributing uniforms, janitorial supplies, mats and towels throughout competitive. Delivery schedules on time. Effectively negotiated sales agreements and terms with potential and existing. Maintained good relationships with account personnel including receivers, and store managers. 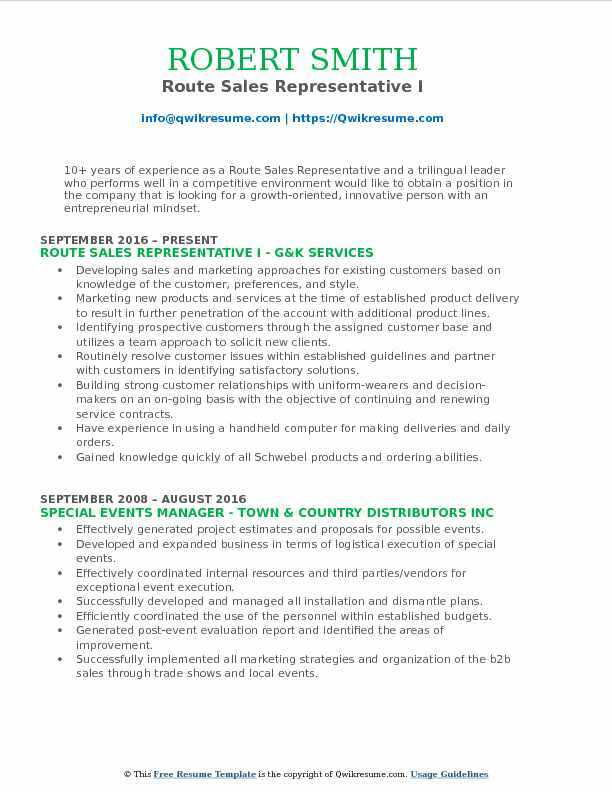 Objective : Talented Route Sales Representative with excellent route and delivery and Two years of experience. Looking forward to being an active contributor to a rising company that offers an opportunity for skill enhancement. Skills : Delivery Driver/ Material Handler, Forklift Operator, Payroll, Hiring, Compensation, Stocking, Truck Driving, Retail Merchandiser, MS Word, Excel, PowerPoint, Delivery, And Sales. Traveling through the assigned territory in company route truck to call on regular and prospective customers to solicit and deliver orders (overnight travel as required). Quote prices and credit terms and prepares sales invoices for orders obtained and collects cash or checks for prior sales. Delivering products to the customer, stocks retail cases and rotates inventory in customer’s coolers as required. Preparing end of day reports of business transactions, places future orders for sales, prepare deposit slips for cash and checks collected, review days sales and informs local management on any unresolved issues or opportunities. Maintaining daily truck inventory and complete weekly physical inventory reports. Compiling lists of prospective customers for use as sales leads, based on information from local management, newspapers, business directories and other sources. In addition to scheduled deliveries, I was responsible for sales to new and existing clients in which I won several inside sales competitions. 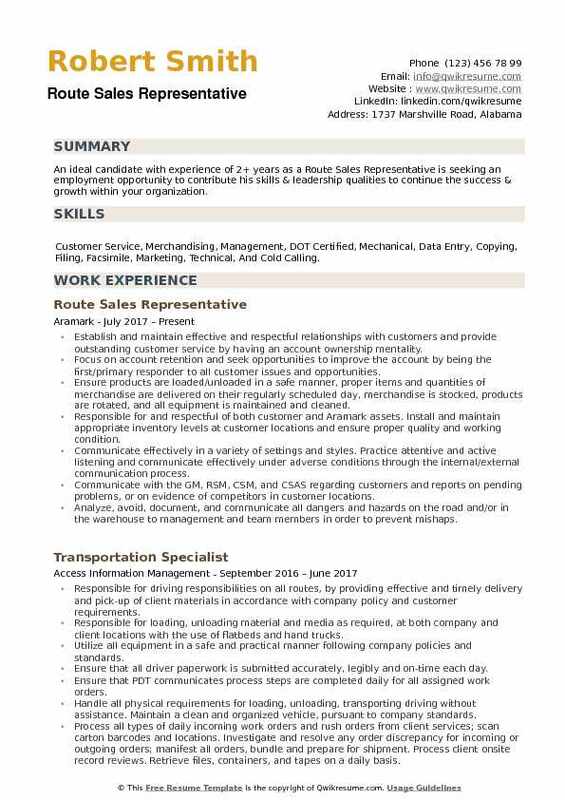 Summary : 10+ years of experience as a Route Sales Representative my career goal is to obtain employment within a company where I can prove my ability and working experience. Skills : Read, And Write Fluent Spanish Proficient In Microsoft Office (Excel, Word, And PowerPoint), Customer Service, And Sales Management. 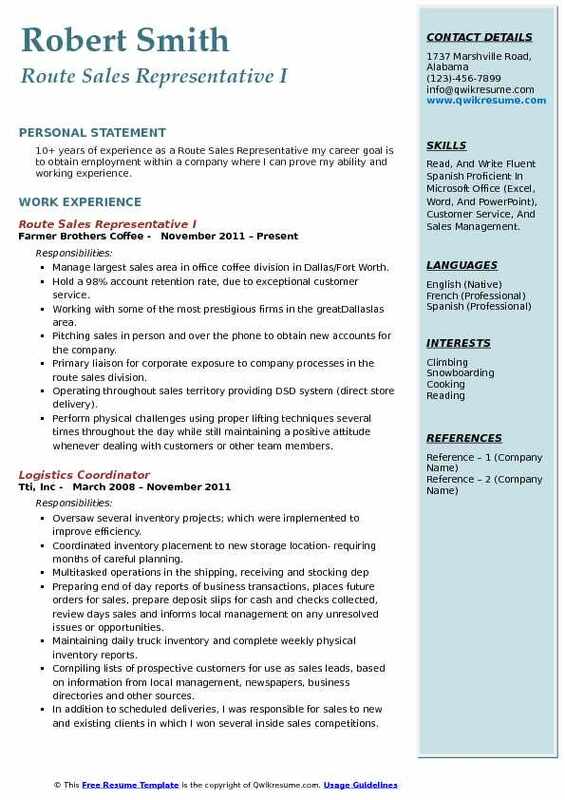 Manage largest sales area in office coffee division in Dallas/Fort Worth. Hold a 98% account retention rate, due to exceptional customer service. Working with some of the most prestigious firms in the greatDallaslas area. Pitching sales in person and over the phone to obtain new accounts for the company. Primary liaison for corporate exposure to company processes in the route sales division. Operating throughout sales territory providing DSD system (direct store delivery). Perform physical challenges using proper lifting techniques several times throughout the day while still maintaining a positive attitude whenever dealing with customers or other team members. Supply customers with the products they need in the amounts they order on their regularly scheduled delivery day. Objective : A hardworking professional with 4 years of experience as a Route Sales Representative is seeking an opportunity of employment from a leading and dynamic company to be a vital team member committed to adding value and delivering success in a professional environment. 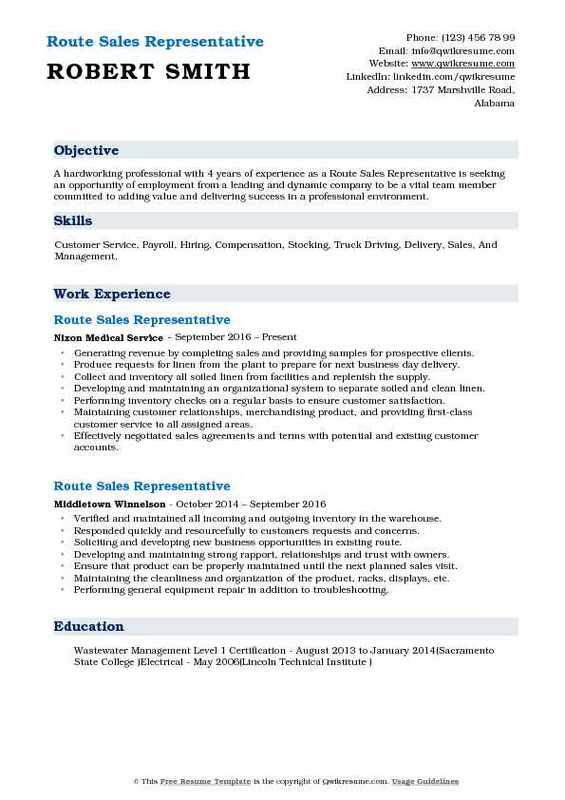 Skills : Customer Service, Payroll, Hiring, Compensation, Stocking, Truck Driving, Delivery, Sales, And Management. Generating revenue by completing sales and providing samples for prospective clients. Produce requests for linen from the plant to prepare for next business day delivery. Collect and inventory all soiled linen from facilities and replenish the supply. Developing and maintaining an organizational system to separate soiled and clean linen. Performing inventory checks on a regular basis to ensure customer satisfaction. Maintaining customer relationships, merchandising product, and providing first-class customer service to all assigned areas. Effectively negotiated sales agreements and terms with potential and existing customer accounts. Recording all customer transactions on customer receipts. Developing relationships by listening to and resolving issues. Summary : 10+ years of experience as a Route Sales Representative and a trilingual leader who performs well in a competitive environment would like to obtain a position in the company that is looking for a growth-oriented, innovative person with an entrepreneurial mindset. Skills : Outside Sales, Project, Special Events Management, B2B, C-Level, B2C, MS Word, MS Excel, MS PowerPoint, MS Project, MS Visio, MS Access, Multilingual: Fluent In English, Russian And Ukrainian. Developing sales and marketing approaches for existing customers based on knowledge of the customer, preferences, and style. Marketing new products and services at the time of established product delivery to result in further penetration of the account with additional product lines. Identifying prospective customers through the assigned customer base and utilizes a team approach to solicit new clients. Routinely resolve customer issues within established guidelines and partner with customers in identifying satisfactory solutions. Building strong customer relationships with uniform-wearers and decision-makers on an on-going basis with the objective of continuing and renewing service contracts. 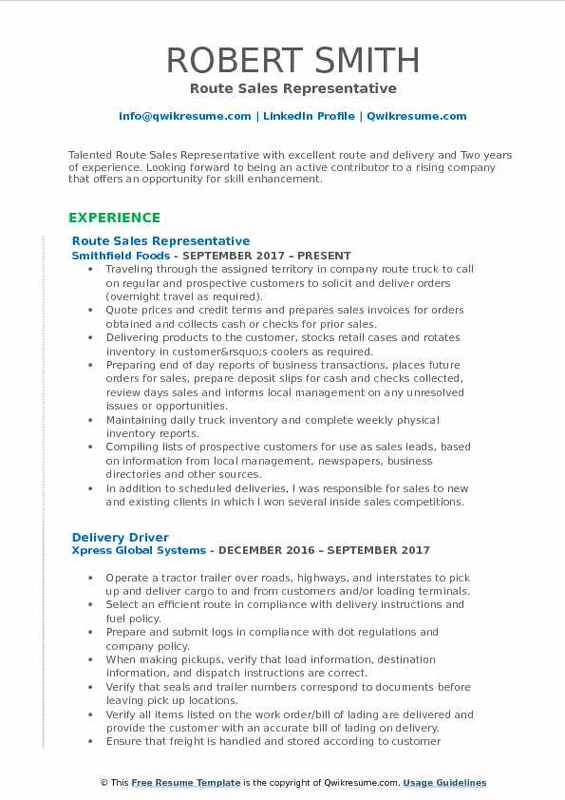 Have experience in using a handheld computer for making deliveries and daily orders. Gained knowledge quickly of all Schwebel products and ordering abilities. Operate company vehicle safely and courteously while following the rules of the road. Verify the daily preventative maintenance of the vehicle and keep the interior of the truck clean, organized, and safely maintained. Comply with all dot requirements. Headline : 6+ years of experience as a Route Sales Representative is seeking to obtain a challenging position in a growing company that focuses on growth and development of their people as well as their business model. 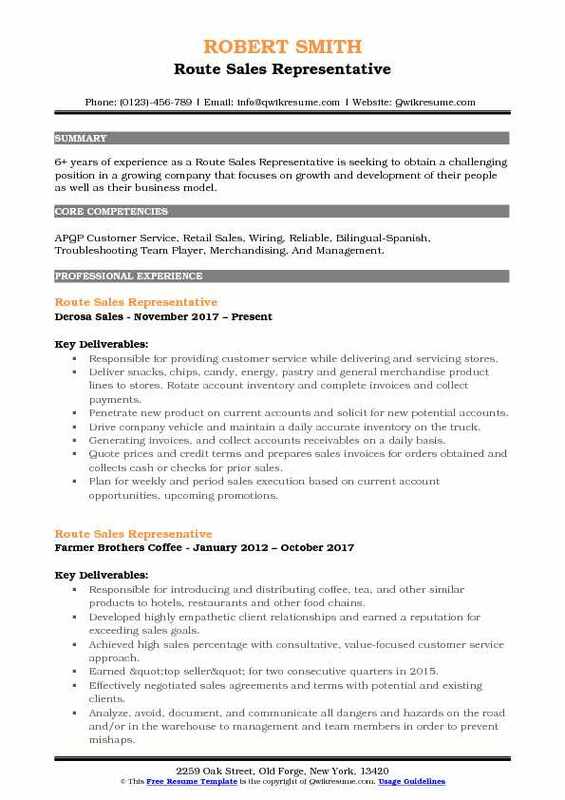 Skills : APQP Customer Service, Retail Sales, Wiring, Reliable, Bilingual-Spanish, Troubleshooting Team Player, Merchandising, And Management. Responsible for providing customer service while delivering and servicing stores. Deliver snacks, chips, candy, energy, pastry and general merchandise product lines to stores. Rotate account inventory and complete invoices and collect payments. Penetrate new product on current accounts and solicit for new potential accounts. Drive company vehicle and maintain a daily accurate inventory on the truck. Generating invoices, and collect accounts receivables on a daily basis. Plan for weekly and period sales execution based on current account opportunities, upcoming promotions. Responsible for early morning deliveries to grocery chain stores and restaurants. 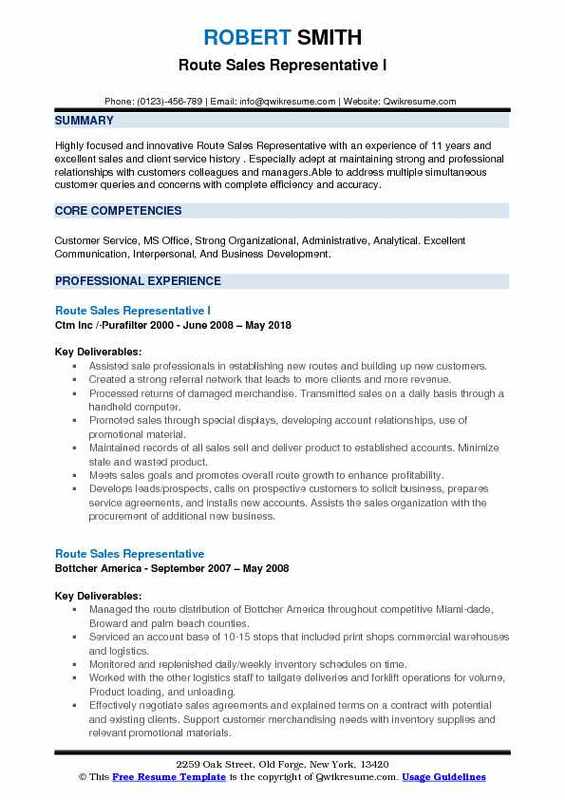 Objective : One year of experience as a Route Sales Representative is looking to obtain a position in a well-oriented company where I can grow as a professional. 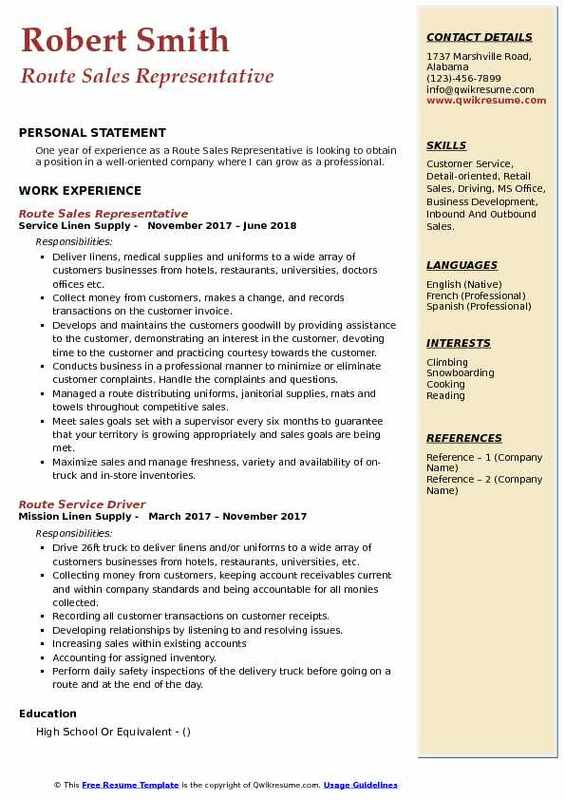 Skills : Customer Service, Detail-oriented, Retail Sales, Driving, MS Office, Business Development, Inbound And Outbound Sales. Deliver linens, medical supplies and uniforms to a wide array of customers businesses from hotels, restaurants, universities, doctors offices etc. Collect money from customers, makes a change, and records transactions on the customer invoice. Develops and maintains the customers' goodwill by providing assistance to the customer, demonstrating an interest in the customer, devoting time to the customer and practicing courtesy towards the customer. Conducts business in a professional manner to minimize or eliminate customer complaints. Handle the complaints and questions. Managed a route distributing uniforms, janitorial supplies, mats and towels throughout competitive sales. Meet sales goals set with a supervisor every six months to guarantee that your territory is growing appropriately and sales goals are being met. Maximize sales and manage freshness, variety and availability of on-truck and in-store inventories. Objective : An ideal candidate with experience of 2+ years as a Route Sales Representative is seeking an employment opportunity to contribute his skills & leadership qualities to continue the success & growth within your organization. 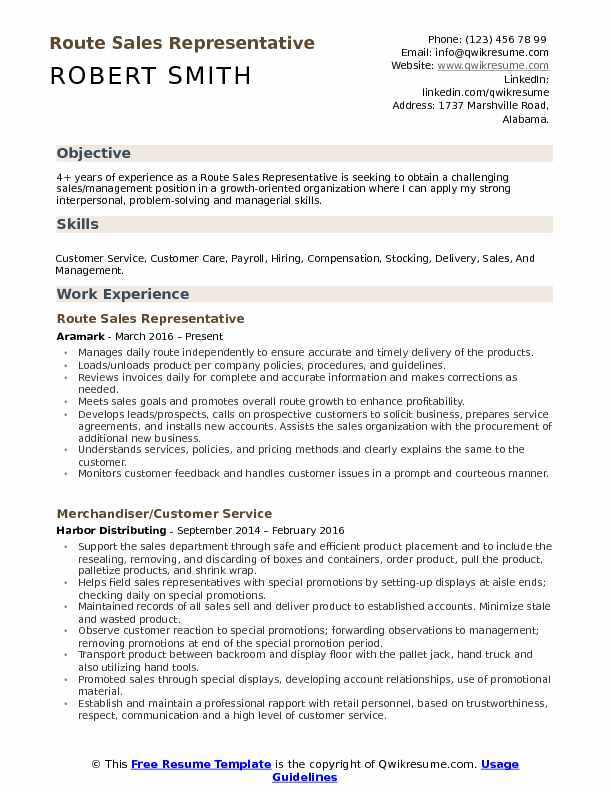 Skills : Customer Service, Merchandising, Management, DOT Certified, Mechanical, Data Entry, Copying, Filing, Facsimile, Marketing, Technical, And Cold Calling. Establish and maintain effective and respectful relationships with customers and provide outstanding customer service by having an account ownership mentality. Focus on account retention and seek opportunities to improve the account by being the first/primary responder to all customer issues and opportunities. Ensure products are loaded/unloaded in a safe manner, proper items and quantities of merchandise are delivered on their regularly scheduled day, merchandise is stocked, products are rotated, and all equipment is maintained and cleaned. Responsible for and respectful of both customer and Aramark assets. Install and maintain appropriate inventory levels at customer locations and ensure proper quality and working condition. Communicate effectively in a variety of settings and styles. Practice attentive and active listening and communicate effectively under adverse conditions through the internal/external communication process. Communicate with the GM, RSM, CSM, and CSAS regarding customers and reports on pending problems, or on evidence of competitors in customer locations. Analyze, avoid, document, and communicate all dangers and hazards on the road and/or in the warehouse to management and team members in order to prevent mishaps. Perform daily safety inspections of a delivery truck before going on the route and at the end of the day.